A new study shows that strong government action combined with long-term planning will increase West Africa’s resilience to climate impacts. Increased extreme weather due to climate change and rising population could imperil West Africa’s food sources. Short-term planning and actions by non-state actors would do the least to combat hunger and climate impacts in the region. 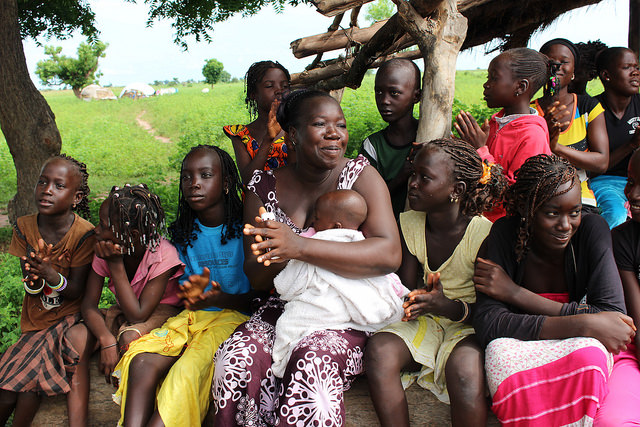 Burkina Faso and Ghana are already employing the study’s findings in their policies. While some leaders in Washington are barely getting their toes wet to address global climate change, researchers at the International Institute for Applied Systems Analysis (IIASA) have dived in head-first. A new study published in Global Environmental Change modeled potential future scenarios for climate change and food security in West Africa to determine how policymakers in the region can move toward a more sustainable and productive future. West Africans are extremely vulnerable to climate change because a large portion of their income is derived from rain-fed agriculture, according to the research. Three-quarters of the population also lives on less than two dollars per day. Potential future challenges include political instability and a rapidly growing population. Palazzo noted that the population could double or triple by 2050. Based on estimates from the United Nations, the population of West Africa could climb from its current number at approximately 371 million to almost 800 million in 2050. In order to slow the current rates of growth, fertility rates must decline – the current average is 5.47 children per woman. Empowering women through education and equal economic opportunities can lower fertility rates, thus slowing population growth, according to a large body of research. Increasing urbanization also adds pressure for more infrastructure to supply water and energy. Incomes may increase, potentially improving food security, but that may also lead to an increase in food imports if demand outstrips local production. Climate change has already begun to exacerbate food insecurities in West Africa, according to the authors of the study. The West African Monsoon (WAM) is critical to agricultural productivity, though records show that there have been large declines in precipitation during the monsoon season. During the 1970s through the 1990s, calamitous droughts were considered significant on a global scale, said Palazzo. According to the paper, projections show that rising levels of atmospheric carbon will lead to future declines in agricultural yields in West Africa. Mariama Keita (center) of Sikilo Village is a farmer who has actively been using climate forecasts to stay productive and thrive under climate change. Photos taken 29-30 September in Kaffrine and Niakhar, Senegal. Photo credit: V. Meadu (CCAFS). The IIASA study sought to be proactive on this issue, rather than reactive. Led by the CGIAR Program on Climate Change, Agriculture, and Food Security (CCAFS), regional scenarios were created to show potential futures for West Africa up to 2050. These scenarios were linked with Shared Socioeconomic Pathways (SSPs), which are global scenarios developed to predict the future of our changing climate. In this way, global projections could be compared to the CCAFS’s regional scenarios and adapted for West Africa specifically. Two important variables for the CCAFS scenarios were whether long-term or short-term goals were prioritized for policy-making and whether state or non-state actors were more prevalent in the process of development. The results of the study show that taking measures to adapt to climate change and to invest in agriculture now will lessen the impacts of climate change in the future. When state-actors dominated and focused on long-term goals, food security improved the most and food prices fell. The opposite scenario, which is categorized by non-state actors and short-term needs, had the highest potential for increased food insecurity. Under this scenario, scientists also expected food prices to rise. 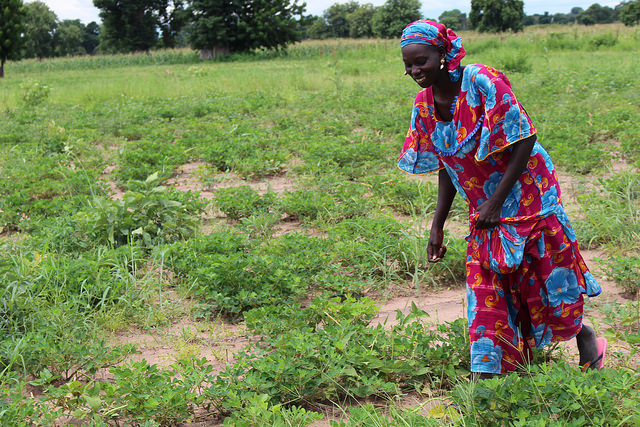 A woman in Daga Biram picks groundnuts (peanuts), an important staple crop in Senegal. Photo credit: V. Meadu (CCAFS). Deforestation rates also varied between scenarios. Approximately 6.2 million hectares of land were saved from being converted to cropland under the state-actor, long-term scenario, compared to only 2.6 million hectares preserved when short-term goals were prioritized by non-state actors. The work done by the IIASA is already being applied by leaders in Burkina Faso, where in 2015 the scenarios were used to revise their National Plan for the Rural Sector (PNSR), leading to multiple policy recommendations. In 2016, leaders in Ghana also used the results of the study to inform policy at a local and national level, including a review of their National Livestock Policy. These examples show that research is already creating tangible change, pushing West Africa toward improved climate resiliency and food security. According to the study, the benefits of strong government action now will ultimately outweigh the costs in West Africa. If we want to prepare for the future challenges of climate change, we simply cannot wait. 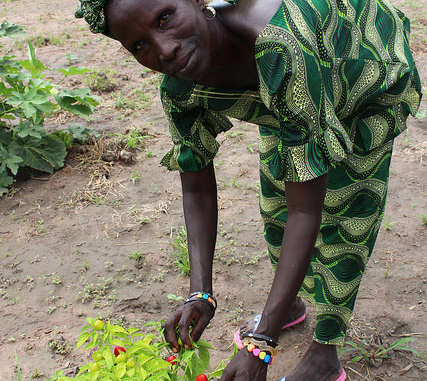 Government investment in agriculture, providing farmers with knowledge and resources such as climate-adapted seeds, and improving coordination between countries and NGOs will better prepare West Africa for the future challenges of a changing climate.